In 1950, off the coast of Sicily near the Aeolian Islands, Italian director Roberto Rossellini filmed a beautiful movie using Stromboli, the land of God, as background. The movie co-star was beautiful Swedish actress Ingrid Bergman, who was awarded the following year the Silver Ribbon Award for best foreign actress in a foreign movie. Considered a classic of Italian neo-realism, the movie was shot with the help of locals that were acting for the first time. It described the harsh life of the inhabitants of an island deserted by the young, and was an immediate success, despite the known love affair that blossomed during the filming between the filmmaker and Bergman. 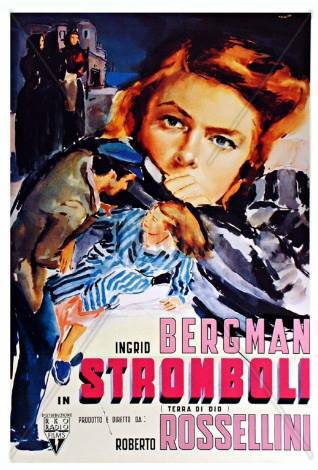 Bergman was able, at the last minute, to get the part instead of Italian actress Anna Magnani. With this film, the Aeolian islands began to be the subject of a growing tourism. Today , in the main square there is a bar called Bar Ingrid in honor of the actress.